It sounds like a privacy advocate's worst nightmare: fire an infrared laser, scan the object, get its time-of-flight, and you can create a 3D imaging system that works at up to a kilometre distance. It's not a completely new idea, of course. It is, in fact, quite close to how we use airborne LIDAR to get high-resolution digital elevation models. However, using infrared “ToF” or time-of-flight imaging for photography poses challenges, most particularly in getting a decent reflection from clothing and other soft materials. A team led by Heriot-Watt University professor Gerald Buller believes it has solved the challenges by improving the sensitivity at the receiver – down to the single photon level. 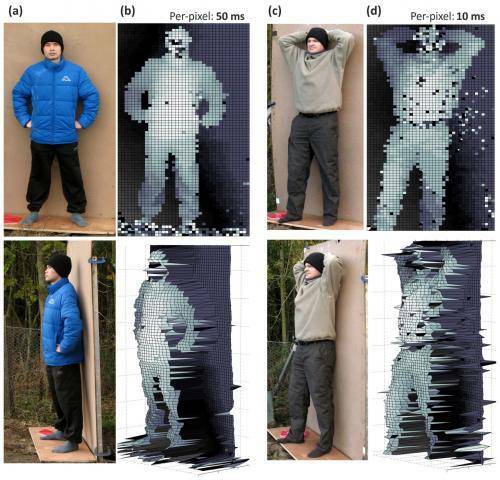 As a result, the group claims it's able to resolve the depth of each pixel down to millimetre accuracy. The scanner uses 1,560 nm pulses which the researchers say works well in the atmosphere and doesn't get drowned out by sunlight. Applications could include “target identification”, a wonderful euphemism for “working out of there's someone you want to shoot hidden in the foliage”, as well as remote vegetation monitoring, and watching the movement of rock faces if they're in danger of collapse. With further development, Heriot-Watt University Research Fellow Aongus McCarthy says, the system could end up both portable and with a range of up to 10 Km. The work has been published in Optics Express (abstract).